For our 50th birthday, my twin sister and I signed on for a three-day trek to Havasu Falls in the Grand Canyon. Day one was long, but the descent from Hualapai Hilltop was not too challenging as we made our way down wide switchbacks that tucked in and out of the shade in the late morning. The biggest worry were the pack horses that trudged in and out of the canyon all day long. Basically, it was their trail and for everyone’s safety, we respected that, calling out warnings when we heard horses approaching. The switchbacks took us down two thousand feet of the three thousand foot descent into the canyon. It was a gradual enough descent that it did not challenge our shared fear of heights. After we passed Supai village and were on our way to the campground, we passed the famous Havasu Falls. You'd think we might have been prepared for the beauty of it, but the effect of coming around a bend to see the falls tumbling over a red cliff wall into a pale turquoise pool was humbling. The raw, rugged beauty of it was peculiar and immense. Since meeting for the first time at dawn, we’d gotten to know our fellow hikers during the day and, as we stood together, quietly at first, sore feet and thirst were forgotten in a moment of appreciation. At picnic tables, in the chilly night air, we enjoyed a fajita feast whipped up by our two guides, and learned about the next day’s activities—a visit to Mooney Falls. It’s going to be about eight to ten miles of hiking, the guides informed us. But first, we would need to climb down a two hundred foot rock face to view the falls. My sister and I gave each other a look, a look that simultaneously said, Uh-oh! and, What do we do now? We grilled the guides with questions and it was soon obvious to the other eleven people in our group that we were terrified of heights and that we did not know what to do about the next day. 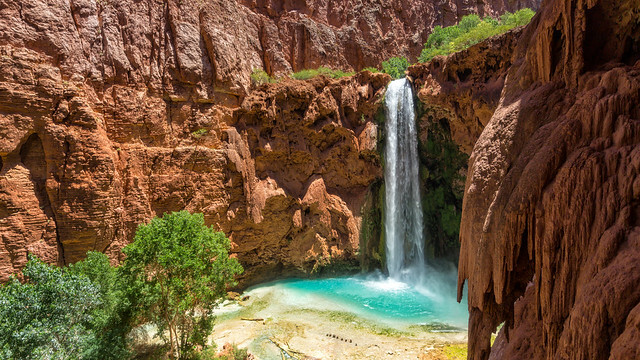 The guides offered to let us hang around the camp for the day or to explore around Havasu Falls, but cautioned us about going further than that because of liability and other concerns. The entire group planned to go, and we’d already discovered that the group was fun and adventurous. We were the only ones waffling. In our cold little tent, we discussed our options. Just planning the trip had involved months of back and forth decision making, and here we were with another big decision that must be made about how to spend our birthday together. Ultimately, we agreed to decide in the morning – at breakfast. At breakfast, we decided that we’d decide when we saw the climb itself. On the trail, we were lulled into a false sense of confidence. The switchbacks were just narrower! Nothing too scary. Yet. Then the group vanished quickly out of sight as we lagged behind with a guide at a sign that read: “Descend at Your Own Risk." The trail appeared to drop into a hole. Gulp. The guide informed us that it was now or never. We'd have to decide. From where we stood, I could just see the top of a waterfall, the top rim of red canyon walls, against blue, blue sky. I would not permit myself to look down. Our guide explained that we would have to enter two caves blasted into the side of the cliff to make the climb to the falls possible. Standing on a mere shelf of a trail, my twin and I stared at one another, partly to keep from looking down and also because, we sisters were looking to each other in hope that one of us would make the decision for both of us. We are the type of hikers who stop to admire a random, lone poppy. We are not adventurers. Suddenly a huge blue butterfly fluttered and floated between our faces and we grinned. The butterfly brought us back into the moment, this beautiful place, and allowed us to simultaneously let go of our fears– fear of heights, fear of letting each other down, fear of not measuring up, fear of not making the most of this opportunity. The butterfly carried it all away. The caves turned out to be the easiest part of the climb, because once you exited the second one you had to follow the three-points-of-contact-at-all-time rule in order to navigate your way down chain ladders slick with waterfall mist. At the bottom, we were rewarded by a patient and a cheering group and a day packed with exploring the random beauty of this portion of the Grand Canyon. As the shadows lengthened and we climbed and hiked until we were exhausted, I looked and looked, but I never did see another big, blue butterfly on the entire trip. Photography via Flickr CCL by Vinh tran, Ryan Malone, and CEBImagery.